Amer Rafique was so badly attacked by the police, he had to have one eye removed. Sight in his other eye was damaged and his jaw boned needed surgery. Amer Rafique was lucky. He lived. But luck didn't hold out for Joy Gardner, Shiji Lapite, Brian Douglas, Ibrahim Sey and the thousand or so other's who since 1969 have died in police custody in England and Wales. This figure does not include those who have died in prisons and mental institutions or immigration detention centres. In countries like Pakistan, people have no faith in the police force. It is common knowledge that police officers are not only in league with all manner of criminals, but in many cases are themselves directly involved in banditry, drug trafficking, kidnapping and murder. Unlike in Britain, police forces in the Third world do not have a sophisticated propaganda machine to justify and camouflage their actions. In Britain the image of the local bobby serving the community hides the fact that none of its officers have ever gone to jail for any custodial killings, even those deemed unlawful by inquest juries. The mighty media machine of this country constantly bombards us with stories of the 'heroic' antics of 'our' police force, countless TV programmes, from Dixon of Dock Green to The Bill, reinforce the propaganda of a fair and just police force. Let alone going to jail, the suspension of officers from duty for such outrages is rare. Imagine the uproar if patients were killed illegally in hospitals ­ and no one even got suspended! School teachers are disciplined for using illegal force on pupils. Why then are police officers getting away with the illegal use of lethal force? There exists a system in which friends look after friends. If any officer is to be investigated, it is another police officer that does the investigating behind closed doors, and being colleagues, well it isn't that difficult to hide any relevant information. Clothes of the dead men are burnt, pages in notebooks go missing, the insides of police vehicles are washed of traces of blood. Just in case there is a slip up, the Police Complaints Authority, are there to act as a powerless go between. And if this was not enough, the officers can rest assured that the Director of Public prosecutions will come out with a statement like 'there is insufficient evidence to warrant a prosecution.' The Police Federation are always looming in the background to ensure that limitless financial resources are available to those officers who might have to appear before a coroner's court! It is an outrage that these killers in blue are not treated like any other section in society. Britain has created an image of itself abroad of a just society, with the rule of law in which officers of the state are held accountable for their actions. One of the major successes of the British state has been its ability to convince its population that social and political problems can be solved through the myriad of legal remedies on offer. One important lesson the families of those killed in police custody have learnt, as indeed do struggling workers, is that the only guarantee of justice is in organising ­ however agonising this may seem. The other major issue the families of the deceased are forced to come to terms with is the complete censoring of information regarding the circumstances of the deaths of their loved ones. Let alone justice being seen to be done, the cardinal principle which we are led to believe lies at the heart of our judicial system, that people have a right to all information is thwarted and every scrap of information has to be snatched out of the clutches of an establishment hell bent on protecting the killers in uniform. During 1994 and 1995 we made "Justice Denied", a film about death during deportation. Even before that film was completed Shiji Lapite was killed by two police officers from Stoke Newington Police Station. We did not know it at the time but Shiji's death was the spark for Injustice. Our primary purpose for starting work on the film was our disgust at the fact that police officers were literally getting away with murder. Many of the most violent killings were of black people. 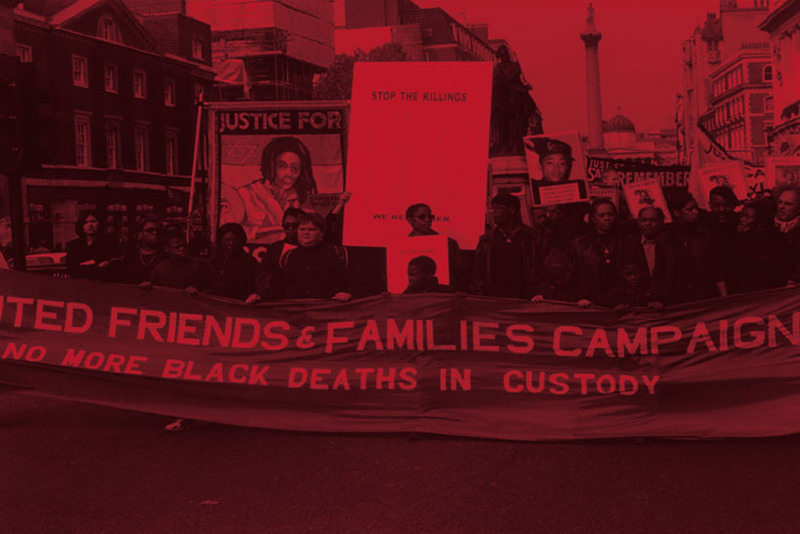 Deaths in custody can never be dismissed. In London in particular, many deaths were met with community resistance. What has been shocking is how the media have usually sung to the tune of the police press releases and various community relations teams. Unless riots followed deaths in police custody there is a conspiracy of silence. It is clear from the experience of black people, both African and Asian, that there is deep rooted racism in the police force. It did not need the Lawrence enquiry to tell this to us. Racist gangs like those that killed Stephen Lawrence are indeed a terrible indictment of the malaise within society at large. But what does it say of when a major para military arm of the state itself has such gangs running amok inside it? A station like Stoke Newington in London, popularly known as Cokey Stokey ( a reference to police involvement in drugs and corruption) has been responsible for five deaths, including Colin Roach who was shot in the police station. But there have also been hundreds, literally hundreds, of attacks on black people. Many of the victims who challenged the police won large out of court settlements, always with the proviso that "this is not an admission of guilt on the part of the officers involved". This is the extent of racism in the Met. It is also the extent of the everyday violence that they dish out to both black and white people who are just going about there daily business. We did not want to make an expose type of film which pretended to be 'balanced'. We knew which side of the fence we were on. We wanted to make a film in which we did not simply document what was happening around the issue of deaths in custody, but show the suffering and resistance of the families of those killed. We wanted to make a testimonial to the resilience and courage of the living and show how despite all the odds, they were struggling for justice and that this thirst could not be quenched until someone answered for the blood of their loved ones. Unlike other journalistic mediums film making is very costly. We could find no broadcaster to commission this film. We met broadcasters who said they were personally interested, but felt the only way they could commission a film about this subject was if one of the police officers was willing to speak? The value of a white face of authority held more importance for television than the lives and struggle of the black families that were fighting for justice. Their other excuse was that they did not want to put out a programme that would prevent the officers getting a fair trial. The only problem was the cases never get to trial and that was the story we were trying to tell! Time and again we were rejected. Broadcasting commissioners in television are very similar to newspapers and magazines editors. They need material to fill in existing slots there just did not seem to be one for people killed by the so-called defenders of the law. No one wants to rock the boat and every one always plays safe. Whilst we tried to get commissioned, the deaths continued and with them the resistance of the families. We continued to film the mounting resistance to each death and became deeply involved in the family led campaigns. The making of the film itself helped to consolidate the unity of the families into the United Families and Friends Campaign,the first coalition of family campaigns run by the families themselves. The days of political opportunists speaking "on behalf of" the families was coming to an end. As film makers we do not believe that we are simply documenters of our subject. Whilst filming we affect change in the subject and the subject changes us. We wanted the making of the film to be part and parcel of the subject of the film. Namely to be a vehicle for the struggle for justice of the families of the dead. As the years went on the deaths continued. After Shiji Lapite came Brian Douglas. Then Wayne Douglas, Ibrahim Sey, Christopher Alder, Roger Sylvester, Sarah Thomas, Harry Stanley - the list is endless. The film continued to track each death, especially those where there was resistance. The coming together of the families in the making of the film gave the film the internal narrative and helped to plot out the vicissitudes of its dramatic progression. It humbled us as workers, for the drama of life was far more dramatic then anything we could have invented. We recorded the events in the lives of the families and campaigns of Shiji, Brian, Joy, Ibrahim and other, over four years. After many years, we then conducted in-depth interviews with the main people involved in these cases. These interviews formed the bedrock of the film¹s narrative. We often shed tears in the editing stage of injustice. But the central aim of our film has been to create a feeling of hope, and not hopelessness. We always felt that this gross violation of human rights is not just a story that needs to be told in Britain. The world needs to hear of this tale. As such we have tried our utmost in the final editing of this film to try to make sure that people anywhere in the world can understand the depth of what is happening in Britain. In the main Injustice has been made almost entirely on voluntary labour. It is as much about the issue as it is about the time scale in which the issue takes place. The film took seven years to make. The abuse of human rights anywhere in the world is a crime against humanity. It is a sad indictment of British society and especially of British media, which will go to untold lengths in exposing human rights violations abroad. Especially in those countries that have fallen out of favour with the British establishment. But will remain silent about the very same thing happening right under its own nose. It is understandable why the various arms of the British establishment, including the media, will protect each other and cover each other's misdeeds. It is however unforgivable that the British left and progressive white people in general have not given this gross violation of human rights the attention that it deserves. At the very least we should all unite to campaign for a change in the law to ensure that a transparent system is brought about that can get these killers in blue prosecuted for murder. As usual the last words go to the families. Myrna Simpson, Joy Gardner's mother, who has been campaigning since Joy's death in 1994 is unrelenting in her belief in struggle as she explains in the film: "There is no other way to get justice except to fight for it and I am still fighting for justice for Joy, but not just for Joy but, like I say always, I am fighting for everyone that has been unjustly killed".